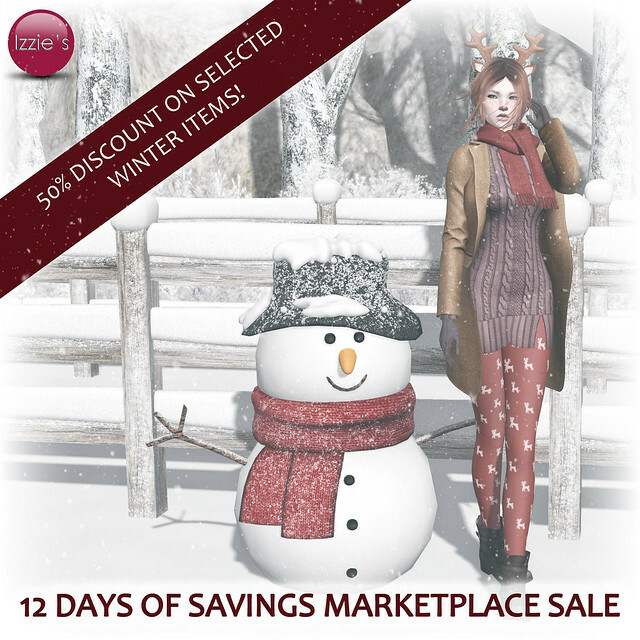 Izzie’s has been invited to participate Linden Lab’s “12 Days of Savings” sale on Marketplace! 10 of Izzie’s best selling winter/christmas items have been marked down 50% – the sale is running from December 14 – December 25th. More infos about the sale and list of all participating stores – click here. Izzie’s is participating the Skin Addiction Black Friday Sale running November 25th – 27th! You get 50% discount on selected skins at Izzie’s mainstore: Brooke (Catwa), Anne (LOGO) and Anya system skin – this includes all skintones and full packs. This sale is for “Skin Addiction” group members only! You’ll find a group joiner and info kiosk at the skins area. Wear the group tag and pay the vendors – you first pay the full price but 50% will get refunded to you right after! Izzie’s is offering a set of Aged Scars at TDR Fusion (new round starts Sunday August 30). The scars come on upper/lower body and head. The tattoo layers are tintable (works for light – dark skins) and appliers come in 7 colors. The face scars come on separate layers each scar, so you can combine as you like. They include system layers for classic avatars, appliers for Slink Physique, Maitreya Lara and Belleza V3. Izzie’s is offering a set of Classic Nails Appliers for Slink Physique, Belleza V3 and Maitreya Lara in 2015 colors for at TDR Fusion. They include appliers for finger- and toenails. Mesh hands and feet are NOT included! 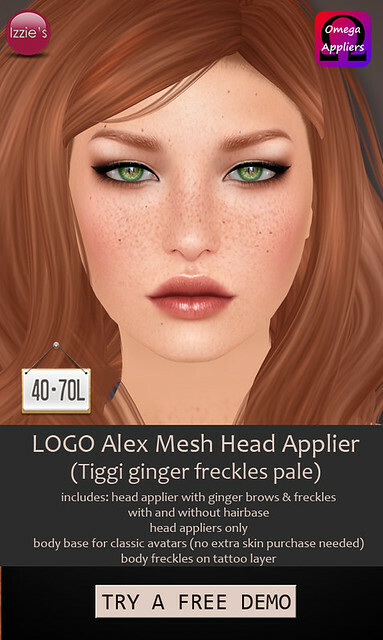 Izzie’s is offering a special ginger freckles applier version for the LOGO Alex Mesh Head in pale skintone at TDR Fusion. It includes head applier with ginger brows and freckles with and without hairbase and a body base for classic avatars and freckles on tattoo layer. A free demo is available.